It's about time! Julie Morgenstern has written an organizing book that covers a new way of looking at the task of organizing effectively without labeling or blaming the person behind the lack of organization. Rather, she says, people who don't organize just never learned how to organize, through no fault of their own--after all, it's not a skill that's taught in school. Th It's about time! 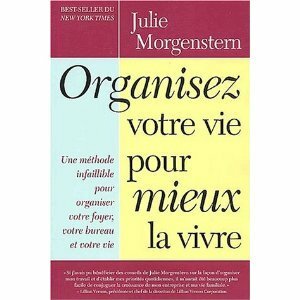 Julie Morgenstern has written an organizing book that covers a new way of looking at the task of organizing effectively without labeling or blaming the person behind the lack of organization. Rather, she says, people who don't organize just never learned how to organize, through no fault of their own--after all, it's not a skill that's taught in school. That said, she gets down to work helping you figure out an organizing system that will really work for you, not a system based on cookie-cutter filing concepts or special storage units. Morgenstern's "from the inside out" system begins by laying out the possible reasons for a failure of organization: technical errors (like having a complex organizing system that breaks down), external realities (like not enough space for your belongings), and psychological obstacles (like fear of failure--or success). Then, her Analyze and Strategize steps help create a plan of action based on your needs and goals, and the brief chapter called "Attack: Getting the Job Done" offers basic ideas for making space. The largest section of the book, "Applying What You've Learned," addresses the specifics of organizing workspaces, home offices, living spaces, and storage areas. Each section has a "How Long Will It Take?" box that gives a realistic time estimate, and Morgenstern's "Julie's No-Brainer Toss List" for each area gives the permission and encouragement that most of us have been waiting for to get rid of things we'll never use again. The section at the end, "Tackling Time and Technology," is worth its weight in DayTimers and PalmPilots. Whatever your organizing issues are, you're not a hopeless case, and you don't need special equipment--just a little understanding of the problem and a willingness to plan before diving in.